As part of the contest we conducted recently, I got many comments from the TechProceed.com readers who choose their favorite database. If you are new to any of the top 5 database mentioned here, please read the rest of the article to understand more about them. MySQL is used in almost all the open source web projects that require a database in the back-end. 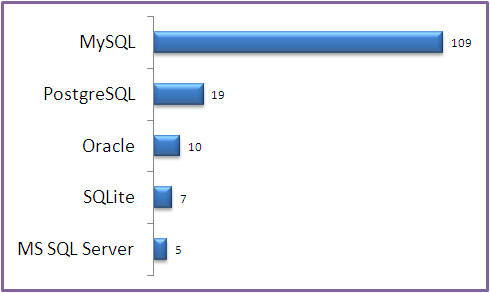 MySQL is part of the powerful LAMP stack along with Linux, Apache and PHP. This was originally created by a company called MySQL AB, which was acquired by Sun Microsystems, which was acquired by Oracle. Since we don’t what Oracle will do with MySQL database, open source community has created several forks of MySQL including Drizzle and MariaDB. MyISAM storage uses b-tree disk tables with index compression for high performance. Support for partitioning and replication. Support for Xpath, full text search. Following are few key features of the oracle database. SQLite does not work like a traditional client-server model with standalone process. Instead, it is a self-contained, server-less SQL database engine. Zero configuration with no setup or admin tasks. Complete database is stored in a single disk file. Work on most *nix flavors, Mac OS X, windows. It’s also cross-platform. This is Microsoft’s flagship Database product. If you are stuck in a company that heavily uses Microsoft products, you might end-up working on MS SQL Server.